As already shared on TT, AIRCEL has launched 3G services across the country with just Punjab and West Bengal circles remaining to experience the high-speed data services. With the Hyderabad launch covered on TT (AIRCEL 3G Mobile Services Now in Hyderabad) we put the services to the test. ACTIVATION PROCEDURE: While the company states one has to send just a single SMS to 121, doing so resulted in several messages being received (below). Same was quite confusing as one would need to ignore the 2G setting-related messages and attend to the 3G messages only. Additionally both the SMS and call centre informs the “Activation Time” as 2 hours – whereas in reality the activation happened in under 10 minutes. 05-03-2011 20:07 – Dear Subscriber, Kindly save the settings sent to you to start using Pocket Internet, Aircel-MMS & Aircel-GPRS. Explore the unlimited possibilities of the Internet on your Aircel phone. 05-03-2011 20:23 – Dear Subscriber, your request has been successfully processed. You will receive a status message from Aircel shortly. 05-03-2011 20:23 – Dear Subscriber. Thank You For Choosing Aircel 3G Services. Your Services Will Be Activated In 02 Hrs. 05-03-2011 20:23 – Dear Subscriber, Aircel 3G services have been activated. To assist you, our Customer Support Representative will call you in between 08 AM to 08 PM. For further information visit www.aircel.com or call customer care at 121. To deactivate 3G, SMS STOP 3G to 121. Well now that we have done with the settings part of the review, let’s get into the main 3G experience. Having clarified the above, the Aircel speeds clocked were 1478 Kbps, quite impressive for peak hour traffic (Testing done between 20:46 – 21:12 hrs on Friday). DATA TRANSFERRED: While browsing speeds can vary by the second, the actual data transferred from 20:46 – 21:36 was 223MB – an average of 4.475 MB per minute. Files downloaded were of 97.9 MB and 97.5 MB respectively. VIDEO CALLS : While the video call was in progress, several distortions of the received image (ie Person called) were noticed, with high amounts of pixellation on the screen. Voice quality on the video call was poor too, with lag (delay) of 2-3 seconds from the time the person had spoken. 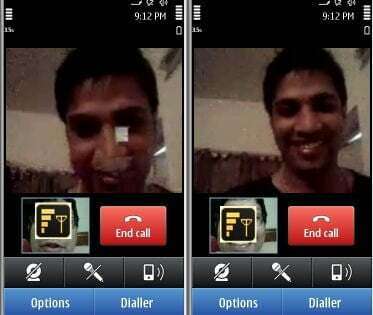 Test Video call was made from AIRCEL to TATA DOCOMO network, which is a plus point, keeping in mind all operators are not offering inter-network Video calling. CONCLUSION: With a browsing speed of 1478Kbps with few users there could be further deterioration in speeds as the number of simultaneous users increases. Also the poor image and voice quality of Video Call needs to be looked into by AIRCEL technical team as this feature would remain once of the highlights of the 3G service.